If you’re under 50, you likely aren’t familiar with the work of comedian Bill Dana. His most famous creation, a character seen on an array of television shows in the 1960s – Jose Jimenez – has been largely forgotten, especially since Dana stopped playing the character (save for one exception) in 1970. 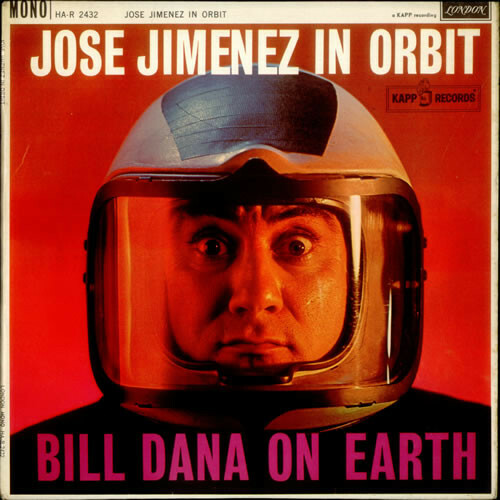 But the Jimenez character was a comedy phenomenon, appearing on Dana’s comedy albums in addition to his many sitcom and variety show appearances. Fans of the movie The Right Stuff may remember one of the Mercury astronauts repeating his catchphrase – “My name Jose Jimenez” – while in the flight capsule, a detail straight out of Tom Wolfe’s non-fiction book, prompted by sketches in which Jimenez was a reluctant astronaut. Dana stopped performing the character 47 years before he passed away in 2017, because of lobbying from Hispanic groups who found the slow-talking, slow-witted Jimenez to be a deeply offensive stereotype. Jose Jimenez would be joined in oblivion a year later by the commercial pitchman Frito Bandito, consigned to the same fate as Jimenez for the same reason: being a negative stereotype, in this case a rootin’-tootin’ shoot ‘em up villain with a taste for Frito-Lays’ corn chip snack and a theme song that included the refrain, “I love Frito Corn Chips, I love them I do/I love Frito Corn Chips I’ll get them from you”. The Frito Bandito was as genuinely threatening as the Hamburglar and as authentic as Eli Wallach’s character in The Magnificent Seven, which is to say not at all. It would take much longer, until 2002, but when the Cartoon Network acquired the rights to the Warner Brothers cartoon family, they withdrew the Speedy Gonzalez cartoons from TV for yet again the same reason, stereotyping. For trivia fans it’s worth noting that both Speedy and the Frito Bandito were voiced by the famed Mel Blanc. 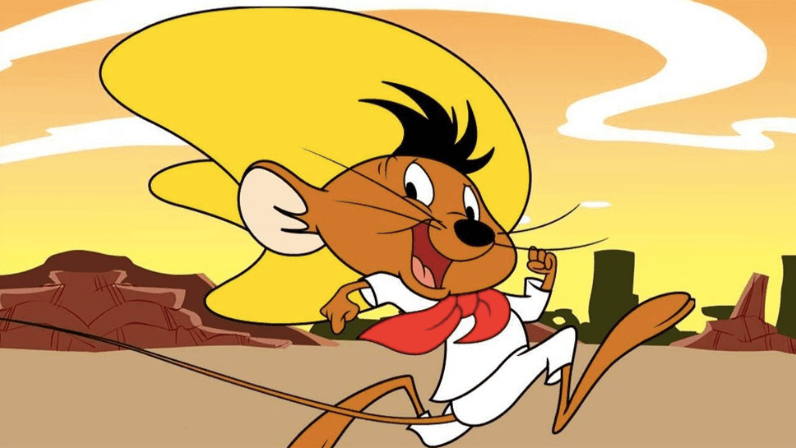 Speedy, for those unfamiliar with him, was regularly portrayed as an anomaly in his Latinx community, with the rest of the rodent characters portrayed as slow talking and slow moving. So with the mass media relegating the afore-mentioned Latinx stereotypes to archives years ago, it’s disconcerting to learn that a small, family-operated theatre north of Salt Lake City, the Pickleville Playhouse, has been producing a series of original shows over the past decade featuring the leading character of “Juanito Bandito”, written and portrayed by the Caucasian actor TJ Davis, sporting a black wig, sketchy accent and absurd handlebar mustache. 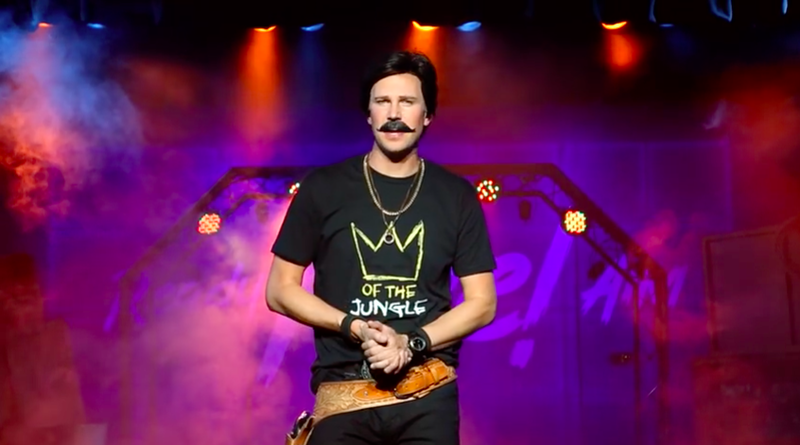 Among the shows featuring this character have been, in chronological order, The Hanging of El Bandito, Bandito Rides Again, Who Shot Juanito Bandito?, The Hanging of El Bandito Reimagined, Bandito Rides Again Reimagined, Who Shot Juanito Bandito Reimagined, Juanito Bandito in the One with the Monkey, Ready, Fire, Aim starring Juanito Bandito and Love & Death vs El Bandito. Oh, there’s also the seasonal favorite, Juanito Bandito’s Christmas Carol. Two days ago I wrote a post trying to explain some of my points of view regarding the Bandito character. I’ve chosen to take it down because even though I thought it might help those who had expressed concern (people who have never actually seen what we do), it seems now that a blog post is not the appropriate avenue. I am absolutely interested in doing the right thing in every aspect of my life. I believe that racial stereotyping is a big problem in the entertainment industry today. 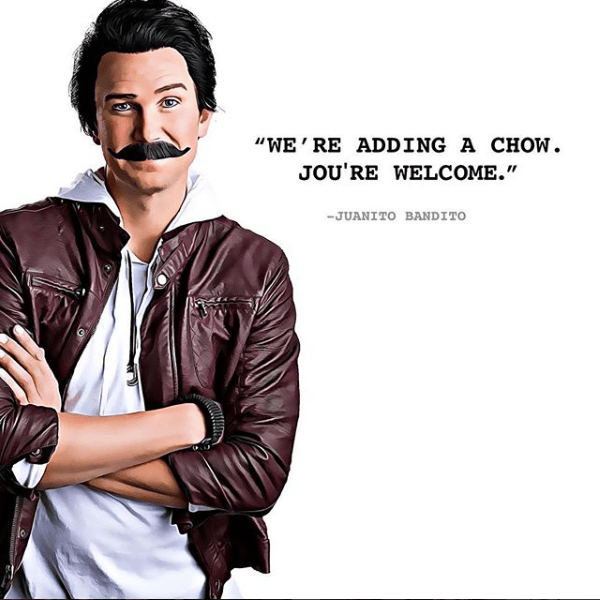 I don’t want to be a part of that problem, and I do not believe that the Bandito productions are a part of that problem. JB is not a stereotype of any race or culture. I do not darken my face with makeup nor have I ever done so in order to make him appear to be Latino. 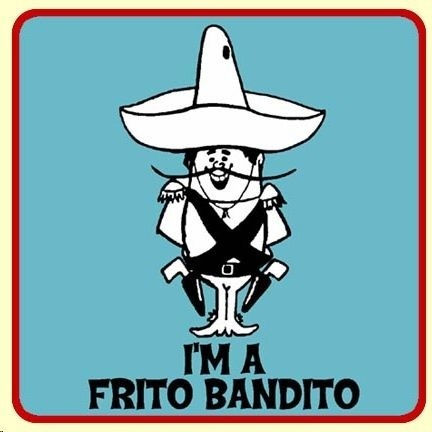 Bandito has been Spanish (from Spain) from the beginning. Davis notes that he doesn’t darken his skin, but seems unaware that one need not employ makeup to deploy brownface, blackface, yellowface and their ilk. His self-admittedly poor accent is more than enough of a tipoff as to which ethnic group he’s referencing; one of his Instagram posts includes the ad line, “We’re adding a chow. Jou’re welcome.” The open captioning on a video from one of the productions features the dialogue, “You chooted at him because he lunched at you?” Pure Jose Jimenez material. He further protests that he is being criticized by people who have not seen what he does. While it’s probable that the rumble of unhappiness is coming predominantly from people who haven’t made it Utah to see the character in action, there’s plenty of video currently online to get a sense of what the portrayal is like. Though Davis’s earlier post indicated that he had Latino friends who told him the character was fine, that’s unlikely to be the prevailing opinion among those he doesn’t already know, as confirmation bias in his existing circle won’t be a factor. Davis says he wants to do the right thing in every aspect of his life, writing, “Our mission in everything we do is to create fun, clean family entertainment to help our communities create lasting memories with those they love.” Let’s take him at his word, with the assumption that his communities include Latinx and Hispanic patrons, or potential patrons. Perhaps he’s unfamiliar with Gonzalez, Jimenez and the Frito spokes-cartoon, since they’ve been out of circulation for almost a half century. Mr. Davis, the right thing is to not make a career of a character that is instantly recognizable as a stereotype, even if he is intentionally a badly drawn version of one. Utah may be a state that is largely Caucasian – as of 2016, per the US Census Bureau, the category of “White alone, not Hispanic or Latino” represented 79% of the Utah population, the next largest category is “Hispanic or Latino” at 14%. But that’s not an excuse for ignoring the minority for the amusement of the majority. In fact, it might argue for even greater sensitivity, since the families that attend the Pickleville shows surely don’t want to be teaching the lesson that it’s fine to laugh at people who are different than you, especially when they are in the minority and overmatched by the dominant ethnicity. Even when intended benignly, brownface is an offense. Your saying the character is not a stereotype doesn’t make it true. Some might see it as unfair to impose this sensibility on a small family playhouse, but it seems that Juanito Bandito has been expanding his territory. Davis’s Instagram account promotes recent holiday shows featuring the character playing beyond his home of Garden City, with gigs at the Eccles Theatre in Logan and the Grand Theatre in Salt Lake City. There have also been student performances for elementary schools, indoctrinating children into the harmless good fun of ethnic ridicule at the earliest opportunity. Sure, some Utahns may mourn the mothballing of an apparently beloved character, but there are those who miss Speedy and Jose as well. Letting go of the past is part of growth and progress, and it seems high time for the Pickleville Playhouse to advance past humor out of the 1960s, especially since such contemporary musical styles as rapping are already part of their performances. After all, if Davis is committed to not offending the Latinx community, in Utah and beyond, he probably doesn’t wan’t to upset the Hispanic community either. Wonderfully written, exactly correct. He’s hiding behind the fact that it’s ‘family friendly’, that he ‘doesn’t darken his face’ and that people go to his shows. Doesn’t make it any less racist. Very on point. He also should be ashamed of that monkey character….with dred locs….omg, really?? So offensive.